An alternative to the increasingly solitary nature of many console and mobile games. Sumit was the lead designer on this project, collaborating with his brother (a senior in the Game Design program at UCSC) and friend Dan Black, who handled the music and sound. The game is intended as an alternative to the increasingly solitary nature of many console and mobile games, being designed strictly for physically social multiplayer settings. 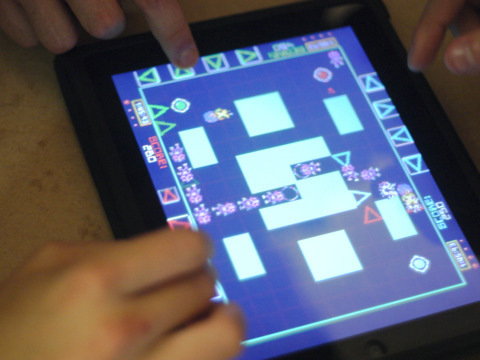 Agameplay video of gVr allows people without iPads to quickly get an idea of the game. Read reviews of the game by Kotaku (Gawker Media; sister site to Gizmodo) and Touch Archade.